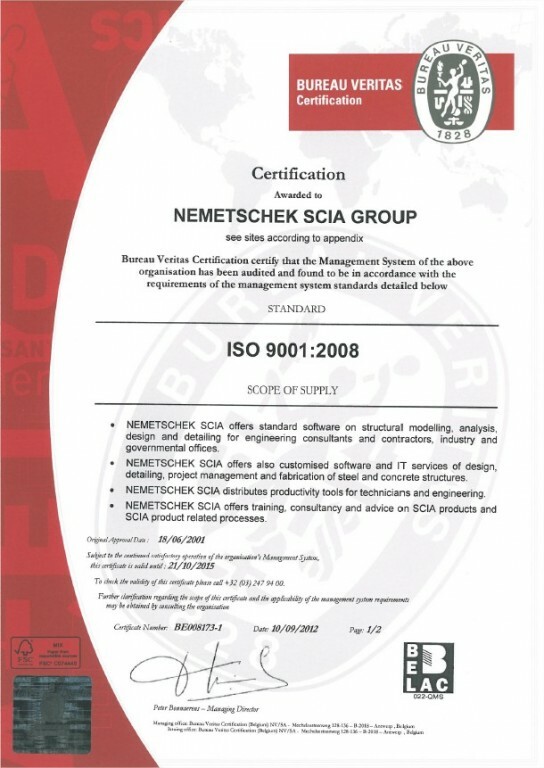 Nemetschek Scia has obtained the renewal of certification for its internal quality assurance system according to ISO 9001:2008. Since 2001, each employee, from the a junior software developer to the CEO, is required to take and pass tests pertaining to the processes, policies, and procedures in their area of responsibility. Nemetschek Scia offers standard software on structural modelling, analysis, design and detailing for engineering consultants and contractors, industry and governmental offices. Nemetschek Scia offers also customised software and IT services of design, detailing, project management and fabrication of steel and concrete structures. Nemetschek Scia offers training, consultancy and advice on Scia products and Scia product related processes. Our Quality Management System contributes significantly to the continuous improvement of our processes, procedures and client satisfaction.